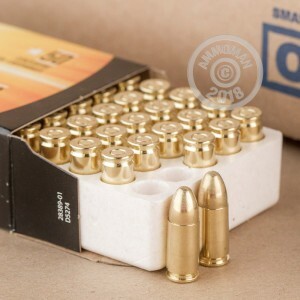 This 1000 round case of full metal jacket 9mm ammo is a great way to stock up for matches, classes, training, or a rainy day. The 124 grain bullet, most commonly used for NATO rounds in this caliber, is chosen for its balance between mild cycling speed and soft recoil that is easy to handle during extended range sessions and longer matches. The cartridges are assembled with brass casings and Boxer primers for easy reloading. These rounds leave the muzzle at 1,090 feet per second with 348 foot-pounds of energy. Armscor is a Philippine-based company with 30 years of history in the US. 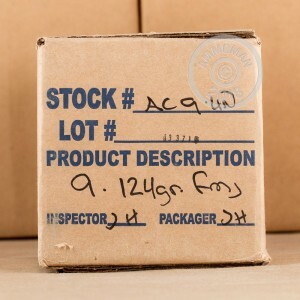 This bulk case from their Precision line offers quality at a reasonable price and qualifies for free shipping from AmmoMan.com. Between the 3 of us there is no miss fires or FTF so what more can you ask for! The firearms were Glock 26 & 19, a S&W and an old HK. It's surprising how fast you can run through 1,000 rds in one day. We would buy it again that's for sure. Thanks to everyone there. 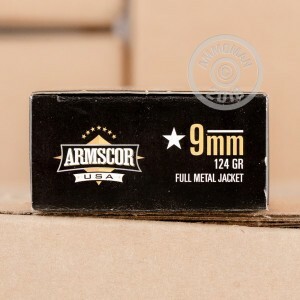 I had used Armscor .22LR ammunition for quite some time, so was expecting good things from the 9mm. I wasn't disappointed. Clean and reliable, round after round. And as a firearms and self defense instructor, I go through a lot of it. Shot 200 rounds from my XD mod.2. All shot perfectly. Would recommend. I've out just over 200 of these rounds through a SIG P320 and haven't had any problems. Great range rounds. very good value, enjoyed the feel of the ammo, i usually shoot smaller grains but this was very nice. Slightly dirty, easy to clean. Good Ammo. My XDs tore through the first 200 rounds with no problems. Good for target practice and waking up the neighbors early on the weekend at my outside berm. Not reliable in my Dan Wesson CBOB. Had too many squibs with this ammo in .45ACP never again.